Download "CONCORDAT TO SUPPORT THE CAREER DEVELOPMENT OF RESEARCHERS: UNIVERSITY OF ABERDEEN IMPLEMENTATION SUMMARY AND ACTION PLAN"
1 CONCORDAT TO SUPPORT THE CAREER DEVELOPMENT OF RESEARCHERS: UNIVERSITY OF ABERDEEN IMPLEMENTATION SUMMARY AND ACTION PLAN During the last academic year, an in-depth gap analysis exercise was undertaken to assess where we are doing well as an institution in relation to the principles of the Concordat and where there is room to enhance our support and provision for researchers. GAP ANALYSIS A summary of the outcomes of the gap analysis, together with our ongoing work and our action plan are detailed in the following document. In summary, the gap analysis led to a number of immediate projects to support identified needs, including: Development of a researcher induction programme (detailed below). 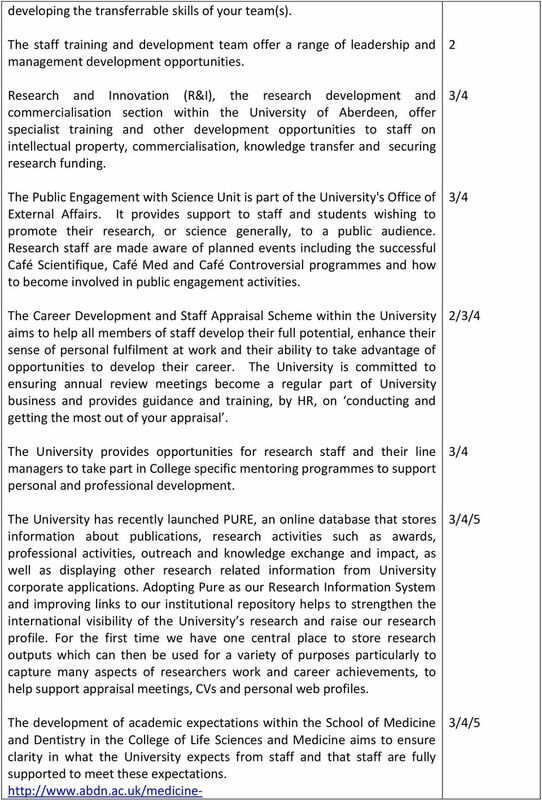 Recruitment of a careers adviser with a specific remit for early career researchers (ECRs) and postgraduate research students. 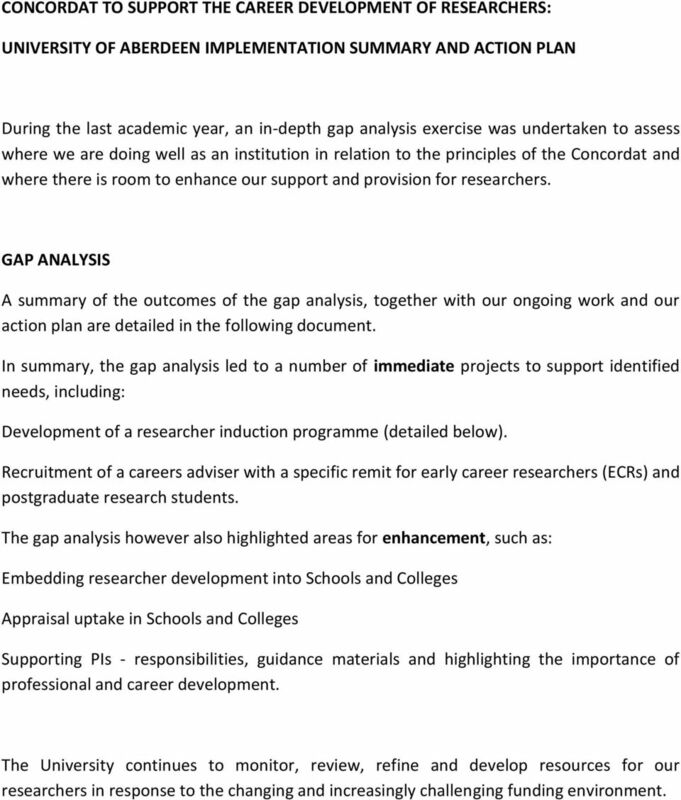 The gap analysis however also highlighted areas for enhancement, such as: Embedding researcher development into Schools and Colleges Appraisal uptake in Schools and Colleges Supporting PIs - responsibilities, guidance materials and highlighting the importance of professional and career development. The University continues to monitor, review, refine and develop resources for our researchers in response to the changing and increasingly challenging funding environment. 8 researchers The University recognises the need to support wellbeing at work and has a number of policies relating to employment wellbeing in addition to offering a Counselling service and access to the Occupational Health Service. An online guide for staff relocating to Aberdeen is provided on the HR website. The Esslemont Group is a Women's network within the College of Life Sciences and Medicine. The impetus for forming the Esslemont Group arose after the huge success of the 'Women on Top' symposium. 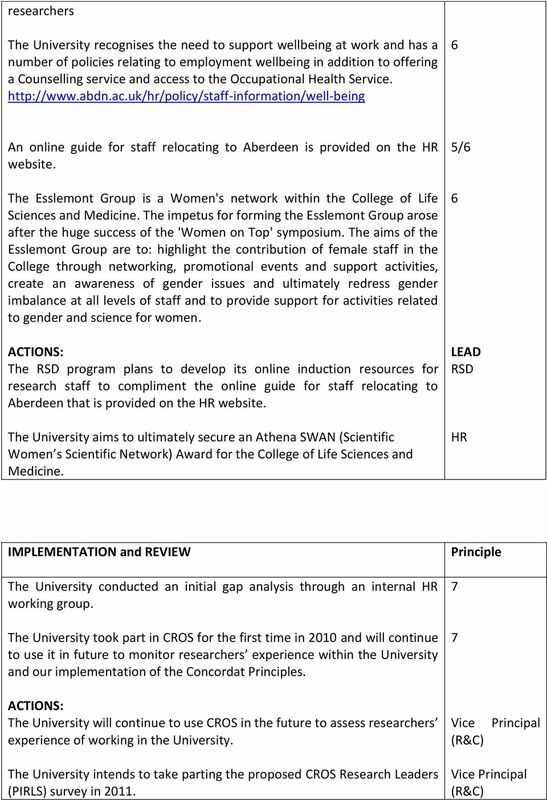 The aims of the Esslemont Group are to: highlight the contribution of female staff in the College through networking, promotional events and support activities, create an awareness of gender issues and ultimately redress gender imbalance at all levels of staff and to provide support for activities related to gender and science for women. 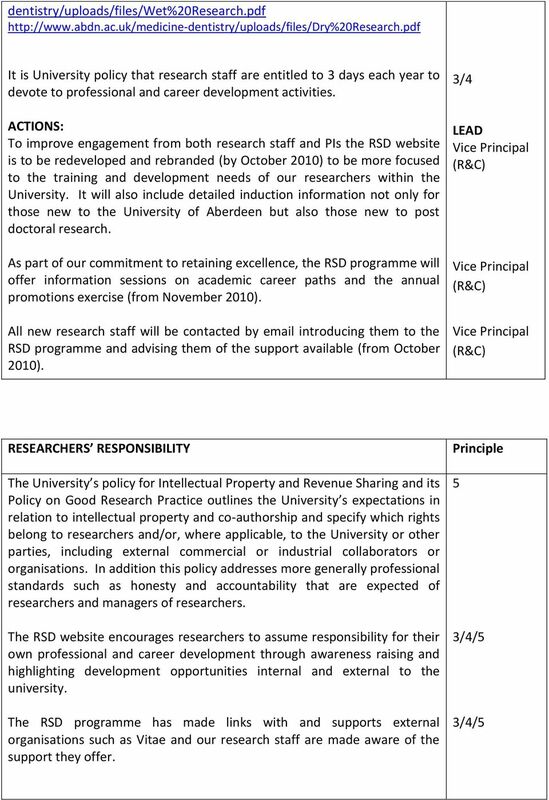 ACTIONS: The RSD program plans to develop its online induction resources for research staff to compliment the online guide for staff relocating to Aberdeen that is provided on the HR website. The University aims to ultimately secure an Athena SWAN (Scientific Women s Scientific Network) Award for the College of Life Sciences and Medicine. 5/ LEAD RSD HR IMPLEMENTATION and REVIEW The University conducted an initial gap analysis through an internal HR working group. The University took part in CROS for the first time in 2010 and will continue to use it in future to monitor researchers experience within the University and our implementation of the Concordat s. 7 7 ACTIONS: The University will continue to use CROS in the future to assess researchers experience of working in the University. 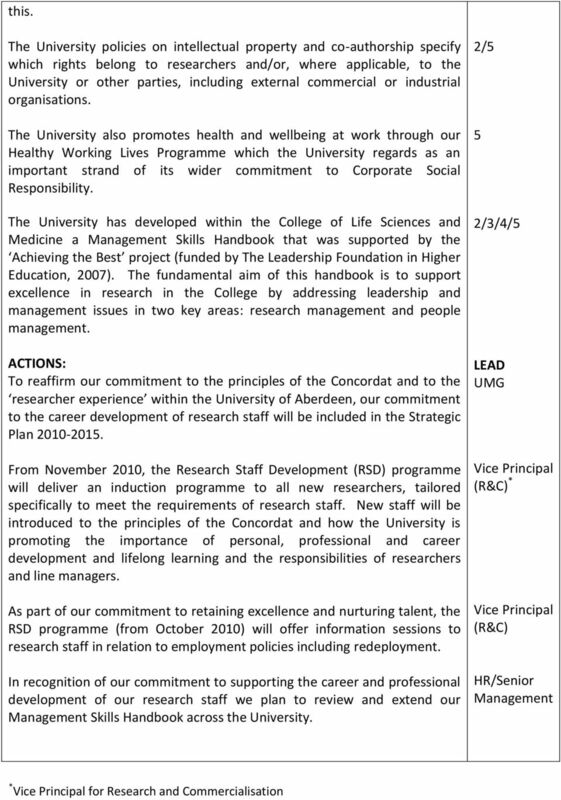 Vice Principal The University intends to take parting the proposed CROS Research Leaders (PIRLS) survey in 2011. 9 An internal Concordat monitoring group (in addition to the University s Management Group (UMG) will be set up to provide updates for senior managers ensuring continued monitoring across all levels of the University. 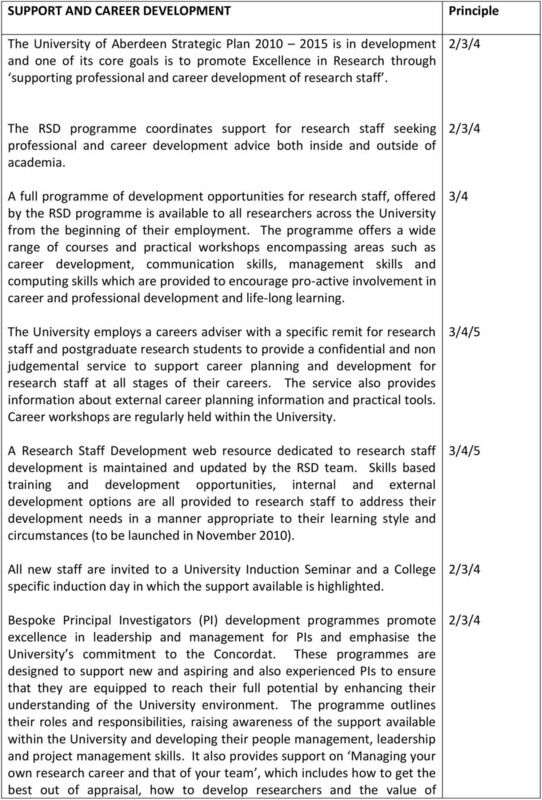 Valuing Research Staff Implementing the Concordat 1 Foreword Contents The University of Hertfordshire undertakes world leading and internationally excellent research across many areas of its portfolio. 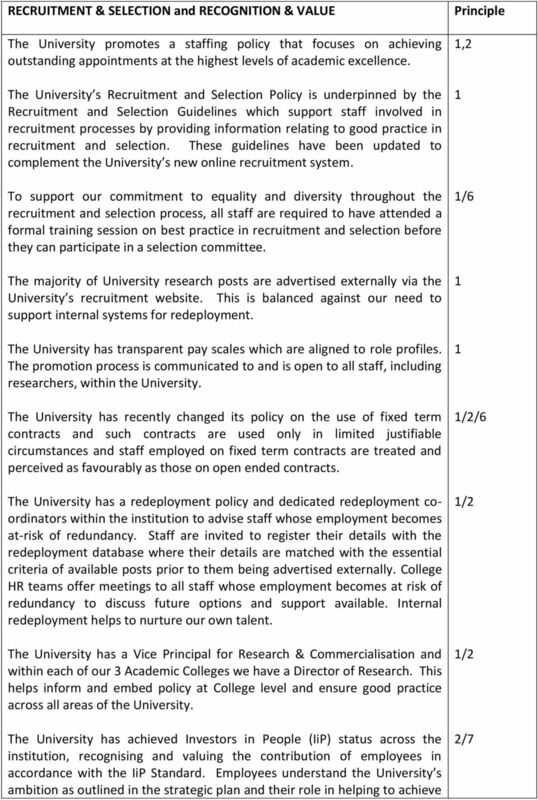 This document covers the AHRC s expectations in respect of support and development for Early Career Researchers (ECR). 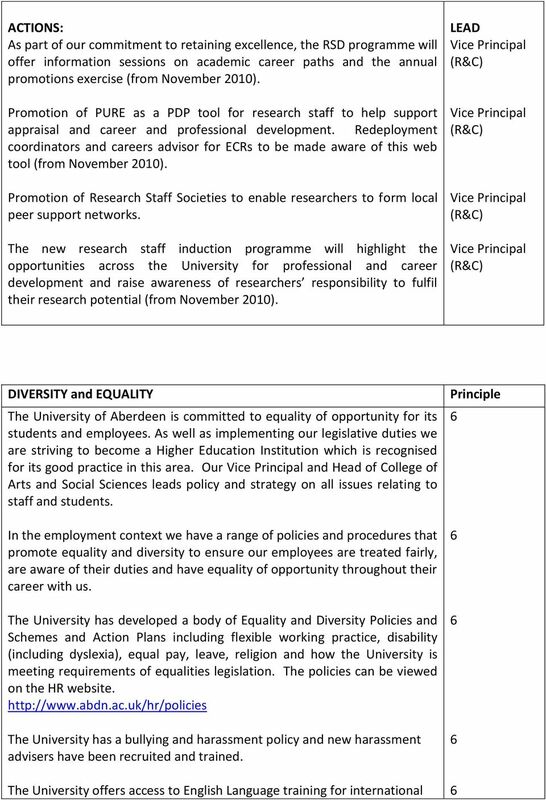 RCUK Action Plan for Equality, Diversity and Inclusion Our ambition is for RCUK to be recognised as a leader in equality and diversity in the research community, working with partners throughout the sector. To work flexibly and contribute to continuous improvement of services provided by the Department.